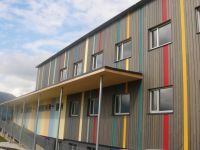 The goal is to provide construction ecological consulting services and arrange the implementation of a chemicals management for the rennovation of the Primary School and the construction of a kindergarden in St. Leonhard near Siebenbrünn. Watch a Video about the project here. Ziel ist es, ein Forum für Forschung und Innovation im Bereich des nachhaltigen Bauens für die Bauwirtschaft Kärntens darzustellen. Es gilt eine Brückenfunktion zwischen angewandter Forschung und Klein- und Mittelbetrieben zu bilden. Es werden aktuelle Forschungsergebnisse den Poolmitgliedern zur Verfügung gestellt und ein Gedankenaustausch gepflegt. Dadurch wird die Möglichkeit zu einem gezielten Wissensaustausch des neuen zukunftsorientierten Themas „Nachhaltiges Bauen“ geschaffen. The goal of the project ist to initialise a transborder improvement of the quality of sustainable building and constructing - thus reinforcing the competitiveness of small and medium firms. By the sensitisation of the customers in the field of building-ecology, energy, healthfully and economically priced living the firms should be encouraged to improve their supply of sustainalbe buildings and products. This interregional and cooperative project promotes also the deregulation and liberalisation of the building sector. Things to know about healthfully building and living for professionals and layperson. Brochure "Ökologisch bauen - gesund wohnen": Info and Download. Things to konw about ecologgically building for professionals and layperson. 2nd edition Primer "Nachhaltig Bauen": Info and Download. The goal is the implementation of information- and consulting services in the province of Carinthia in the fields of comprehensive thermal-energy-efficient retrofit of large residential buildings. The goal is to present the nabaupool, the Nabau-Fibel, the programm "klima:aktiv" and our services concerning the energy performance certifications. The project goal is to offer the opportunity, to assess the need for consultation and the will on implementation of sustainable building concepts, by construction experts as well as by people who build their own homes.